Owning a home is a big responsibility. With such a large responsibility that owning home can be, homeowners attempt to do the responsible thing by looking for ways to lower living and energy cost. You see this much more so now than ever before with an unstable economy more and more homeowners are looking for ways to downsize or live on less. A few simple ways that homeowners are accomplishing this would be by carpooling or looking for new and innovative ways to save on energy cost. Everyone says that if you want to lower energy cost turn off light and keep your air conditioning at a constant 78 degrees, dry your laundry during the hottest part of the day, etc. For those living in warmer states, the idea of leaving the house temperature on a constant 78 degrees is not very appealing nor is the idea of running a hot dryer in a 78 degree house during the hottest part of the day; surely there is a better way of lowering energy cost. Thankfully, there is a better way to save some extra money on energy cost without turning your home into a sweat box. One area that most homeowners overlook when it comes to lowering their homes energy cost is by checking to see if the home has a ventilation system that is working effectively. A poorly maintained ventilation system can actually increase ones energy cost. In order to prevent that from occurring, inspect the pieces that are designed to regulate the out and inflow of air throughout the home. If your motorized damper is not working correctly, then your energy bill might reflect so. A motorized damper is used to determine the amount of air flow that is allowed to escape and penetrate a particular room in the house. 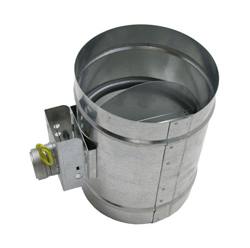 Motorized dampers have the capability to completely cut off air flow to a particular room or rooms. Motorized dampers give homeowners the option to regulate air flow to certain lived in areas of the home as well as restrict the air flow to the rooms in the home that are not currently being used. For homeowners living in warmer climate states, motorized dampers can be a great way to save money without being forced to live in uncomfortable living conditions.